On January 16, 2019, AC CeProSARD, represented by Ms. Marija Mojsovska, Environmental Engineer, attended the fourth of the Open Days for Civil Society Initiatives, which refers to the “Clean Air Plan for 2019 and the time framework for its implementation “. 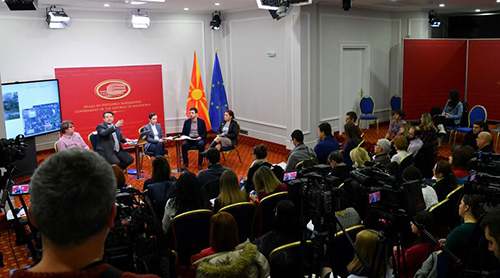 The event was held at the Media Center in the Government of the Republic of Macedonia. The event was addressed by the Deputy Minister of Environment, Jani Makraduli, the head of the cabinet of the Mayor of the City of Skopje, Nikola Naumoski, Darko Blinkov from the State Environmental Inspectorate and Ana Colovic Leshoska from the association “Eko-svest“. The discussion was open to representatives of civil society and a discussion was held on the four components of the Program for Reduction of Air Pollution for 2019. In the process of implementation of the Clean Air Plan it is planned to actively involve the associations of citizens, especially in the area of detection of the coal furnaces and the process of educating the citizens and initiating their replacement with environmentally friendly devices (inverters, pellet stoves and more efficient wood stoves). This process foresees financial motivation of the AC for performance.